After a diagnosis of Alzheimer's disease, families face fears and difficult medical decisions. Alzheimer's disease represents a personal health crisis, but it's also a family concern. What does it mean for your children or siblings if you are diagnosed with Alzheimer's? What does it mean for you if a close relative develops the condition? "People think that if their dad or aunt or uncle had Alzheimer's disease, they are doomed. But, no, that's not true," says Dr. Gad Marshall, assistant professor of neurology at Harvard Medical School. "Even though family history adds to the overall risk, age still usually trumps it quite a bit. It means your risk is higher, but it's not that much higher, if you consider the absolute numbers." Studies of family history say that if you have a close relative who has been diagnosed with Alzheimer's disease—the most common form of dementia in older adults—your risk increases by about 30%. This is a relative risk increase, meaning a 30% hike in your existing risk. If you are age 65, the risk of being diagnosed with Alzheimer's is 2% per year, although this also means a 98% chance per year of not developing Alzheimer's. In absolute numbers, a 2% annual risk means that two out of 100 65-year-olds will develop dementia every year. Family history raises the 2% annual risk by about 30%, to 2.6% per year. That means going from 20 cases in a group of 1,000 to 26 in 1,000, or six additional cases in 1,000. "So the absolute increase is relatively small," Dr. Marshall says. Age raises the chance of Alzheimer's more than family history. People in their 70s have a 5% chance of being diagnosed—more than twice that of people in their 60s. Family history raises this by 30%, from 5% to 6.5%. Again, the absolute change is relatively small. When a relative is diagnosed with dementia later in life, family members often wonder if they should be tested for the "Alzheimer's gene." The short answer is no. "It can be a quick no or a long no, with more explanation, but the answer is nearly always no," Dr. Marshall says. "It's not going to be helpful, since it won't tell you whether you will develop the disease. It will only tell you if you are at a greater or lower risk." For Alzheimer's disease that begins later in life—the vast majority of cases—a gene called apolipoprotein E (APOE4) is associated with greater risk for dementia. If you inherit one copy of APOE4, your risk triples. If you have two copies, your risk is 10 to 15 times higher (this is rare). But having APOE4 does not mean you will definitely develop dementia. Among people who age normally into their 70s, about 25% still have one or more copies of the risk gene. Nor does the absence of APOE4 protect you: about 35% of people with Alzheimer's don't have one of the risk genes. This means that if genetic testing reveals that you have one or more copies of APOE4, it will not tell you what you really want to know: will you definitely get Alzheimer's disease—or will you not? Knowing that you have the risk gene could instill fear and negatively influence your life decisions. Genetic counselors discourage testing in people with close relatives who developed Alzheimer's disease later in life. "Having the gene says you have a higher risk, but it does not mean that you will get dementia," Dr. Marshall emphasizes. Contact the Alzheimer's Association (www.alz.org). 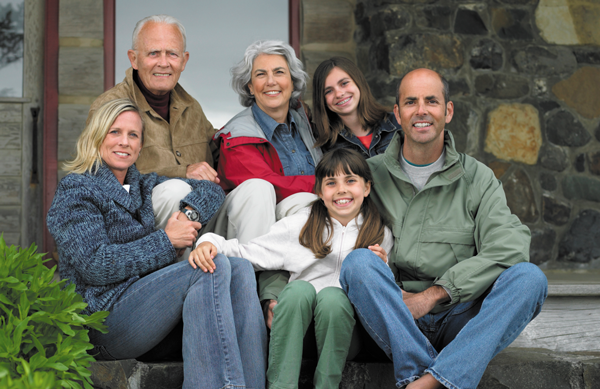 Find out about resources available to help you and your family. State and county agencies may also be able to help. Plan for the future. This includes legally designating someone to make health care and financial decisions for the affected person when he or she can't. Investigate long-term care options. Nursing care is expensive, and finding a good place can take time. Start early. Take care of physical health. People with dementia who live a healthy lifestyle tend to progress more slowly to the later stages. Steer away from genetic testing. Even if you have the APOE Alzheimer's risk gene, it usually doesn't mean you will develop dementia later in life.